As I write this, there is a cat on my lap. Of course, not all people are cat people. But a lot of us are, judging from the number of views of cat videos on the Internet. Some days, I’m convinced that cat videos are among the best things that the Internet has done for humanity. Cat videos bring joy. They unite us, even if only for a few minutes. And they’re often downright hilarious. 2018 was a challenging year. But – lest you’re getting worried – this is not a political piece. My last piece of political writing was in 2016, shortly after the election that ushered in the 45th President of the United States. This is a piece about cats. Yes, they bring chaos, and perhaps there are a few analogies that can be drawn between a household with cats and the current political climate. But while cats create chaos like no other domestic creature I know, they are also irresistible. And unlike politicians, prone to purring on your lap. So when the going gets tough, the tough get a cat. Or in my case, a second cat. My original feline companion is a cool cat named Hendrix, adopted from a litter of barn kittens in 2014. The farmers assured my husband and I that our new pet was female. Fast forward two weeks later to our first vet visit, and we discovered that kitty is a boy. Still, Hendrix is a delightful, handsome fellow who enjoys cuddling up to watch period dramas and snuggling in bed on chilly nights. 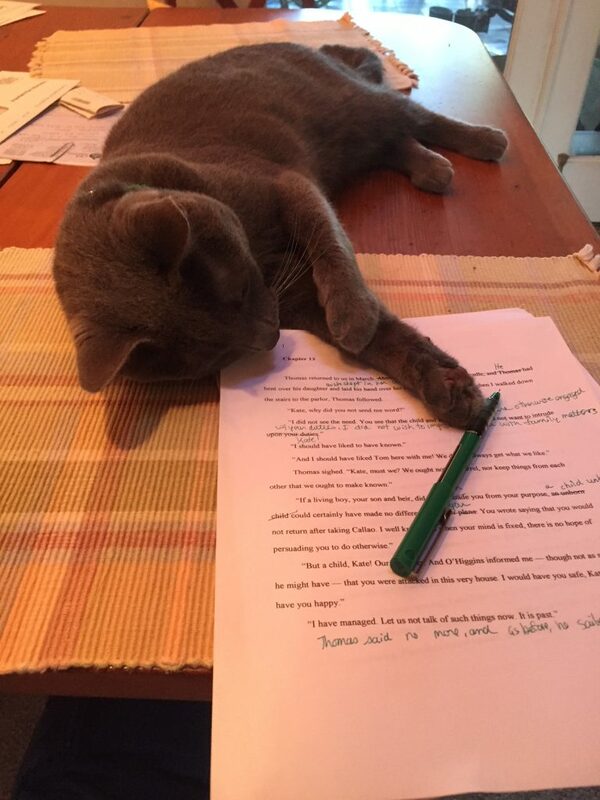 He’s a great editor, as cats are naturally contemptuous of anything superfluous. I love Hendrix. He’s a fantastic cat. But when an opportunity came last fall to see another litter of farm kittens in need of homes, I couldn’t say no. And Abby, the most adorable 3-pound tyrant the world has ever seen entered our lives. Following the advice of cat blogs, I determined to keep the two cats separated until Hendrix grew more tolerant. Abby had a private establishment in the family room, complete with a bed, food and water, a litter box, toys, and a large window overlooking a bird feeder. She hated it. And she made her displeasure known. First she screamed. 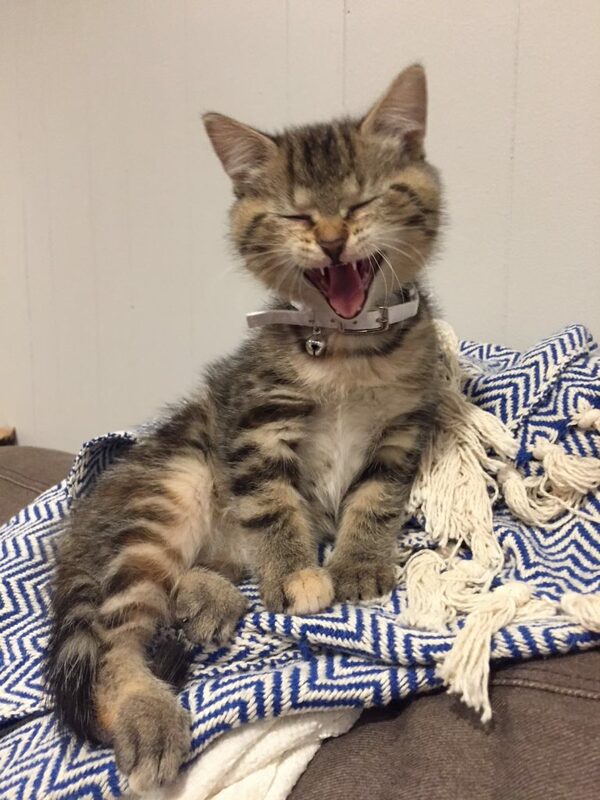 (Yes, kittens can scream.) Then she battered the door with her tiny body as if she meant to break through by force. After a few days of this we relented and gave Abby the run of the house. Gradually – very gradually – Hendrix came to a grudging acceptance. He still steals her food at every opportunity, but I have caught them napping in the same room and sometimes even in the same bed. Abby is crazy, of course. She’s imperious and demanding and very, very loud. Beneath her kitten adorableness lies the soul of a despot. But I love her. And having her in our lives makes me happy. So when I say get a cat, what I mean is do something that makes you happy. Do something that fills a void. Do something that makes the world, at least for a little while, a gentler place. Unless you’re allergic. In which case, get a fish? And be sure to post some funny fish videos.